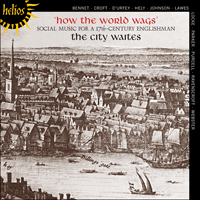 The songs and consort pieces on this recording have one thing in common: they were all written for domestic performance, and they therefore cover a wide range of social activity in the seventeenth century. But while music was available to all classes, all classes of music were not available to everyone. It is highly improbable that the average farm labourer for instance would have heard Matthew Locke’s elegant ‘Little Consorts’, written, as they were, for ‘Several Friends’. Public concerts, unheard of before the reign of Charles II, were not a regular occurrence until the eighteenth century, and then only in the larger cities. However, the ‘several friends’ could certainly have heard—and very likely enjoyed—in less refined circumstances, the broadside ballads performed on this disc. Yet in this kind onley, it [music] may seeme somewhat niggardly and unkind, in never [as yet] publikely communicating, but alwayes privately retaining, and as it were, enuying to all, this more familiar mirth and jocund melodic. But it may be Musicke hath hitherto beene defective in this vaine because this vaine indeed, hath hitherto been defective in Musicke; and therefore, that fault now being mended, this kind of Musicke also is now commended to all mens kind acceptation. This did I willingly undertake, and have easily effected, that all might equally pertake of that which is so generally affected. It is perhaps difficult to understand at first sight why the ballad-buying public should be interested in, say, a fictional wedding at Winchester—after all, nothing very unusual happens. There is no gripping story here. Similarly, the jolly barber’s fate at the hands of a ‘girl of the game’ is as familiar as the story of Adam and Eve. Nonetheless ballads, with these simple themes about millers, vintners, foresters, and people from all walks of life, sold in hundreds of thousands. At one time the balladeer Martin Parker was running a syndicate of no fewer than twenty writers. Of course, our interest in the social minutiae of our neighbours has not diminished, but it is now almost exclusively the province of the serials and soap operas purveyed by the current media of radio and television which have, sadly, led to the near demise of the kind of social and sociable music-making presented on this disc.